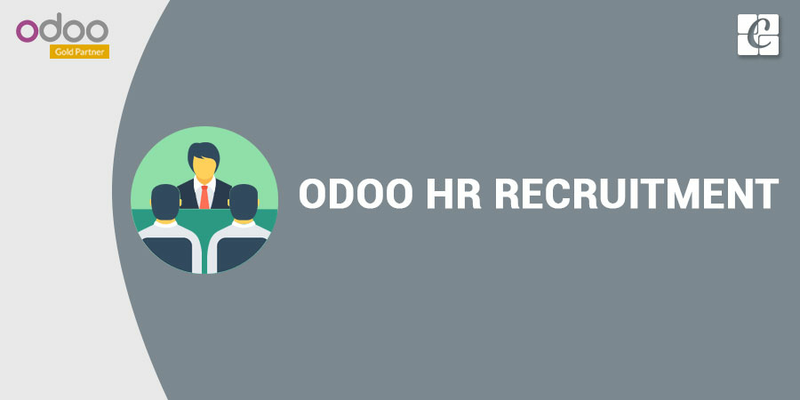 Odoo makes easy the recruitment process by ensuring feasible HR Process. Here we have recruitment plugins related to HR. Officers or managers can create and launch various job positions for recruitment. For these positions users can manually apply or through the website. For that, we have to install an extra plugin named online jobs related to recruitment. This plugin actually provides the functionality to publish or unpublished the jobs. Each application through web portal is recorded on the backend for further process. According to the firm's stages on the recruitment process, these applications can be utilized and manager or officers can make the applicant as an employee from the application records if the applicant meets the requirements and is a good performer. 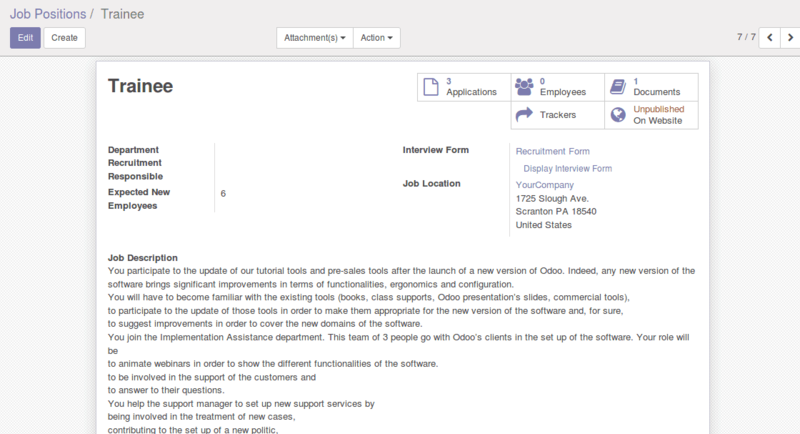 After Installation of Odoo HR Recruitment add-on, the menu Recruitment on main menu container is visible and you can see the following position already if demo data is enabled. 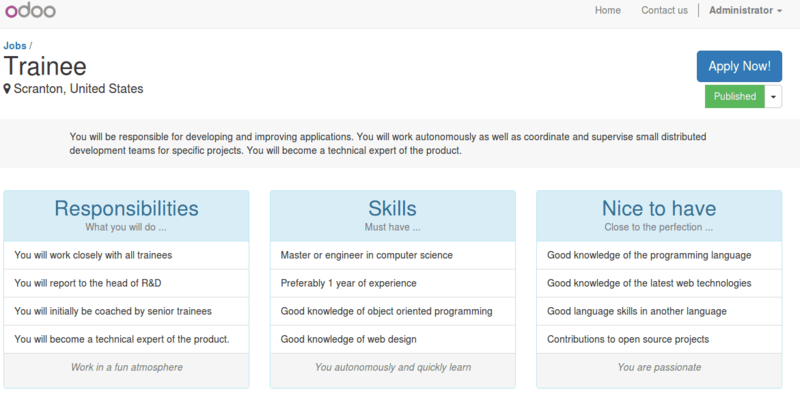 This is the dashboard which lists out the whole created positions and its status. Using Create Button and filling the form below will create a new position. Department: Select the department which we are creating the current position, using the selection list. Recruitment Responsible: Usually will be department head or manager. Expected Employees: Total number of employees need to be recruited. Interview Form: The questionnaire needs to be filled by applicants. Job Location: Current Job Location where the going to be recruited. This can be published online by managers or HOD. After Publishing to the public, users can apply on the website using job portal page. Click on the apply button after selecting proper positions. The form comes when you apply button. Submitting the form will create a back-end record which can be processed by department or person responsible for the selected recruitment. The new application will be created on the backend for job position trainee and will be in the initial qualification stage. Just drag and drop to change the stages. 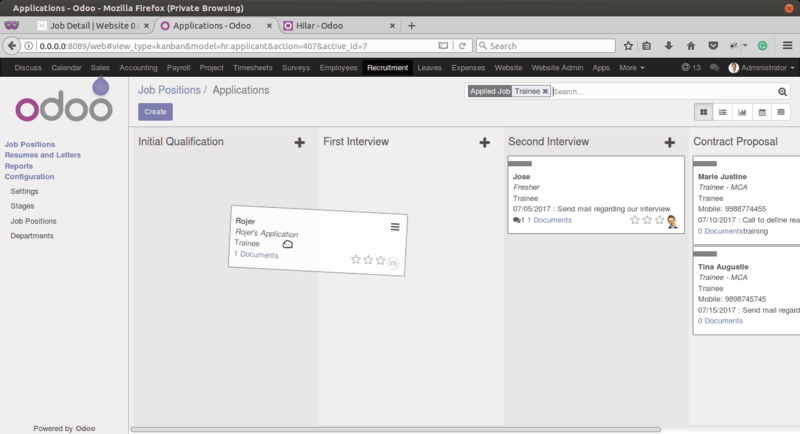 Form view of an application. 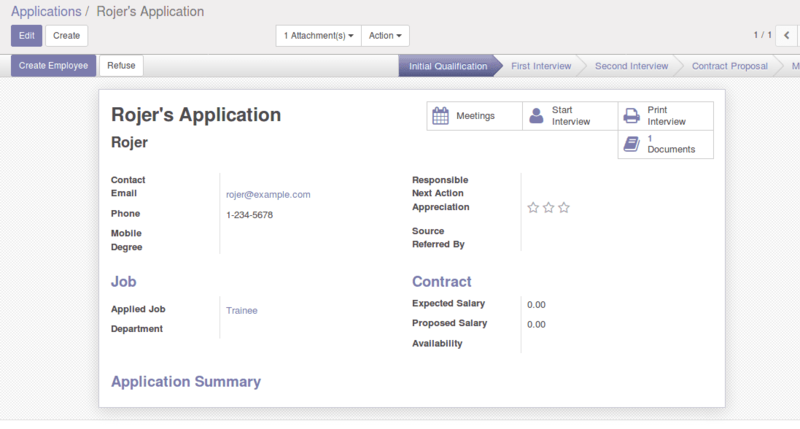 Using the smart button- start interview, users can answer the questionnaire related to the job position. The uploaded resume will be shown when you click on smart button document or under the attachments button on above the header. 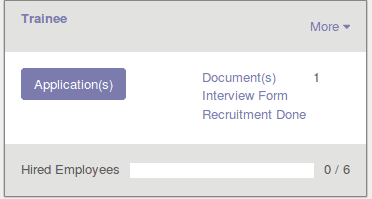 By using the print interview button, responsible persons can verify the submitted answers and use the create Employee Button they can create the employee if the applicant successfully has gone through all stages we defined for a current job position. If the recruitment is over, then using recruitment done button on dashboard we can stop the recruitment. The resumes or other documents provided by the applicants can be managed using the menu Resumes and Letters. The Kanban view of all applicant's letters will be presented here. 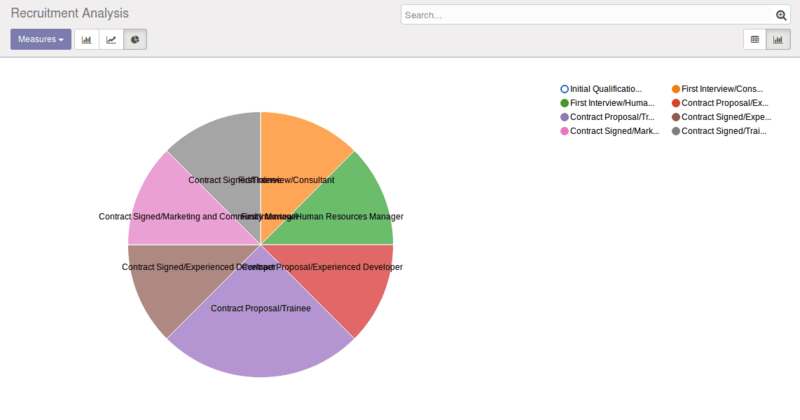 Using the documents button on job positions, dashboard view will list out the related documents of the current job position. Using the Application button under New menu, you can manually create Applications for a current job position. 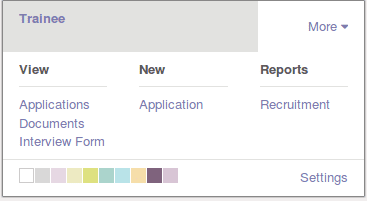 And using Recruitment Button you will get the reports of a current position. 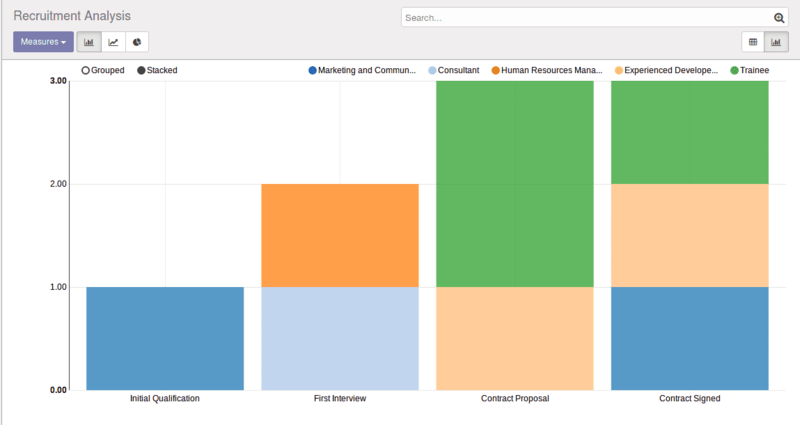 Managers or the head of departments can easily analyze the recruitment process and export it to excel.